11/17/2018 T’was the night before light up! When Houle was called… It was not looking good for Christmas this year at Uptown Shopping Centre, Victoria. The annual tree light up and opening of The Cottage (where children can see Santa) was to take place Saturday, November 17, but we got a call the Wednesday November 14, that Santa needed our help. This tree light up has been regularly attended by Houle people and families of all generations for several years now and we weren’t about to let our city or our customer down. Houle was able to stick-handle the final commissioning to get the cottage approved, just a day before the tree light up. 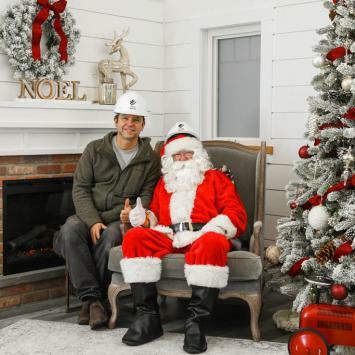 It was an honour for Houle to be part of making Santa’s Cottage happen for the city this year.